What a day! We were planning Christine's early return to London last night based on our understanding of my itinerary and the bad weather forecast. Instead we decided over breakfast - with hugely helpful advice from our fabulous hostess at Zum Hollander at Jausenstation in Neuberg - to rearrange the schedule so we could both enjoy 2 more good days walking (the weather forecast has apparently improved and it's now going to be fine all week). To be honest I was a bit nervous about the next two days walking on my own. I'm still high in the Alps and walking without a map. After yesterday's experience where two pairs of eyes were essential for keeping on route I was worried about getting lost. It would also have felt like a bit of a failure for Christine to go home early. What she didn't want to do was go back to Krampen and as it happened the Gasthof we were staying at was next to the route 445 which would take us directly back to the E4 and save a few hours walking. So with a plan, clean after our first shower for 4 days and well breakfasted, we set off at 9.15am up the 800 metres to Schneealpen Haus where we planned to have an early lunch. It was a beautiful walk up through mixed forest on a good path, nice steady climb with great views back to Neuberg and Krampen. 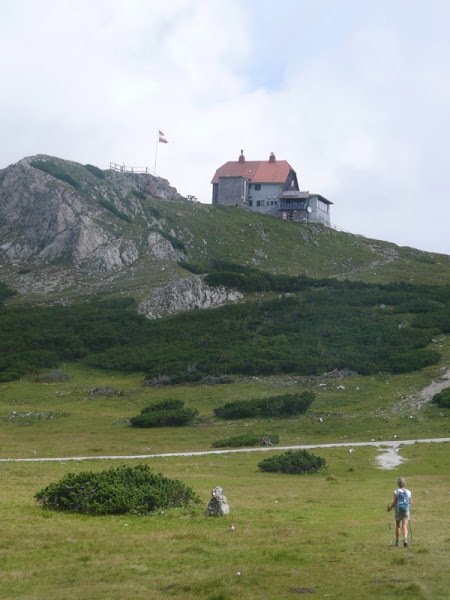 Once we'd done the steep pull up to the top, the landscape opened out and we walked over alpine grazing land to reach Schneealpen Haus at 11.45am. It looked a very good hutte, amazing location and views, and good food and loos. We decided to have a blow out and ordered beef with noodles and vegetables, enjoying our first fresh vegetables (fried courgettes) for over 2 weeks. Delicious. At this point we weren't sure how much farther we should go. It looked like the clouds were building up so we decided to walk to the next hutte, have strudel and then decide. We got to Lurgbauer Hutte in an hour (incidentally we were beating the signs in terms of walking time all day : very satisfying). After further gastronomic (right word?) reinforcement we felt suitably energised to go for it and aim for the Karl Ludwig Haus, some 30k and 1800 m of ascent from where we started at breakfast. It was either this or stay put. Our plan to stay at the Zimmerman Hutte half way along was thwarted because it was closed. The clouds blew over and the weather turned out to be perfect for tough walking. Not too hot and a nice fresh breeze. We set off on what the signs said was a 5 hour walk, unhelpfully graded as black. 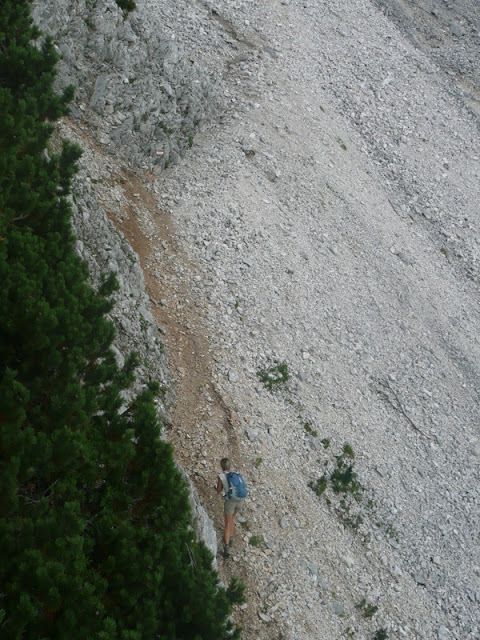 The first hour or so was steep downhill on limestone; had to concentrate and save the knees. The route then flattened out and we went over a col and the point of no return. 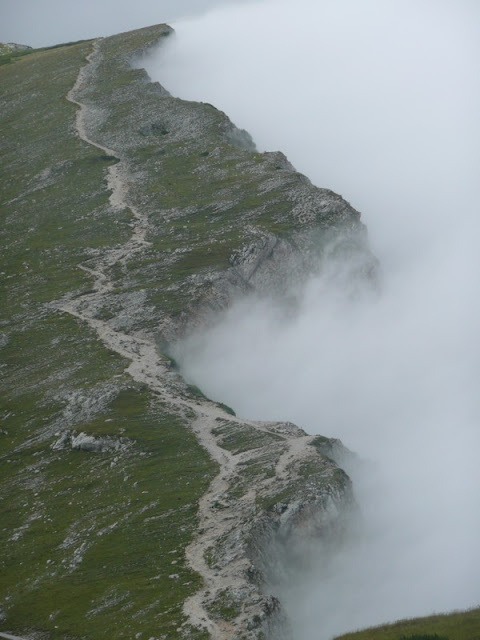 The mountain opposite was vertical and further signs warned that the route was not for the faint hearted. We started up. At first it was easy, a steady climb up a nice forest path and then a bit steeper following the course of a stream. Then the fun started. Round a corner was a steep scree slope with little visible sign of any path. We were nervous but reasoned that we had done worse before. Up and across we went. More steep up and then we came to the fixed ropes, not just a few fixed ropes but all the way up the mountain. I was too busy taking pictures to look down but there were sheer drops everywhere. There was so much fixed rope that our confidence started to grow and we started to enjoy it and made rapid progress up the cliff. Every now and then the semblance of a path returned for a few yards, only to be followed by more climbing or by another scree traverse. In total I think we climbed around 250 metres with the aid of ropes and ladders and have never done such a sustained steep climb like this before. 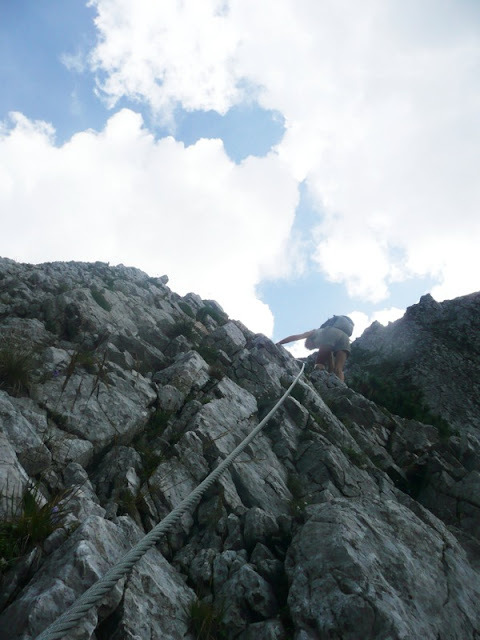 Over the edge and then an easy walk then to the top of Heukuppe and views back to where we have walked over the last few days: the dreaded Lugauer; Hochschwab where we wandered lost in the mist; and Veitsch where we had a memorable night in the Graf Meran Haus. Then down to the Karl Ludwig Hutte which turns out to be utterly modern and refurbished with proper showers, loos that flush and our own room. Slightly freaky local weather conditions have produced a dramatic effect with cloud butting the high cliff where the hutte sits, with clear sky beyond. Very happy to sit in the bar with large beers and study the microclimate. So an amazing day. 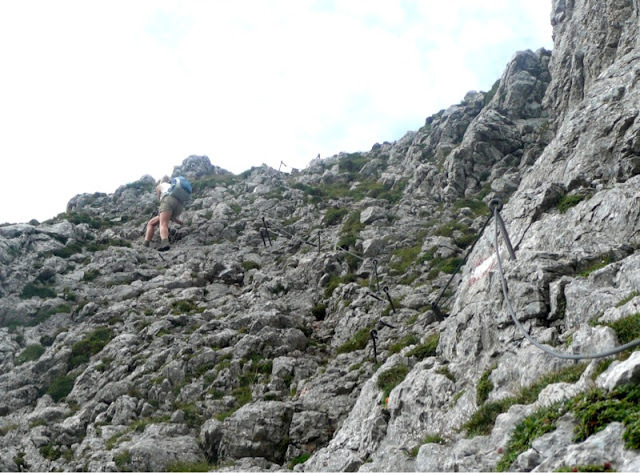 The last big climb of the walk, the most exciting climb of the walk and definitely one the best days. Best of all I was able to share it with Christine. John. To share that marvellous day also with your afectionate readers I should say. Thanks for the updates John! You guys are doing amazingly well considering the walking conditions - the climbs and the poor weather! 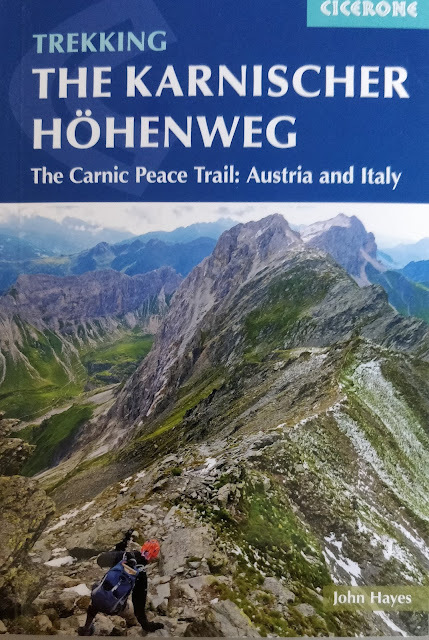 Austria's landscape has been a real surprise - get a lot of info on the Swiss mountains but Austria seems just as spectacular. Good luck!